Trojan-Spy.Win32.GreenScreen, also known as Spy.Win32.GreenScreen, is a Rogue AntiSpyware alert which was made only to trick and scare users into buying their fake software products like InternetAntivirus, AntiSpywareMaster, AntivirusMaster, AV Master, Antivirus2008, AntivirusXP2008, Ultimate Antivirus2008, Antivirus2009, XPAntivirus 2009. Trojan-Spy.Win32.GreenScreen infection begins, when user opens a video and installs fake video Codec's like Video ActiveX Codec or other. But the user does not know that a Trojan hides Under this codec name. After installation, user will be infected with a Trojan like Trojan Zlob, which shows a lot of fake security error messages, which offer to do a system scan with fake software. Trojan-Spy.Win32.GreenScreen error messages is only one of many exaggerated system fake eeror messages to trick and scare the users to buy rogue antispyware. Is user will buy a rogue antipsyware to delete Trojan-Spy.Win32.GreenScreen will keep silent for some time. Do not try to buy any rogue antispyware that Trojan-Spy.Win32.GreenScreen promotes and remove it as soon as possible! 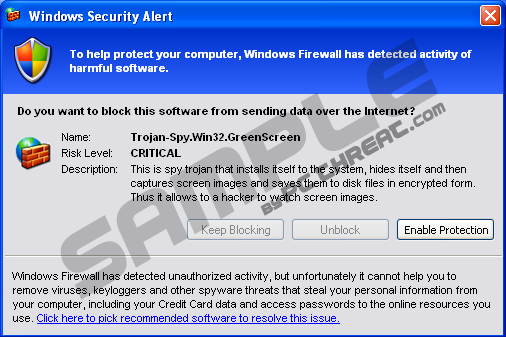 Quick & tested solution for Trojan-Spy.Win32.GreenScreen removal.